In an attempt to address the issues of flooding, malaria, cholera and other hazards associated with water in Kaduna environment, the state government through waste management company known as Zoom Lion Global Alliance (ZLGA-Nigeria) on Friday began desilting of Kaduna river expected to end by 31st of December 2016. The first phase of desilting of the river which is a separate contract from what ZLGA is doing in the state is to evacuate waste debris from kaduna river starting from Malali through Shooting Range, Kigo, Water Board, Tudun Wada down to Flour Mill axis of the river. Commissioner, Ministry of Environment and Natural Resources, Shehu Balarabe Giwa said, the desilting exercise is the extension of keeping Kaduna greener, cleaner and safer initiative of Governor Nasir El-Rufai, aimed at improving social lives, aquatic and good water for domestic and agricultural purposes in the state. According to him, the main sources of water treatment for Water Board is drawn from river kaduna, “so by clean up the river, it will enhance safe water for people resident in the state and reduce their medical bills. “Government is also looking at reducing diseases like malaria, cholera etc by a way of removing dirt from the river. When this is done, stagnant dirty water that gives chance to mosquitoes and other insects to breed will be addressed. “I will like to use this opportunity to call on our people to stop dumping refuse into the river because it affect aquatic and plant survival and the effect will be on us. “We want to thank the company for what it is doing. We are not regretting awarding the contract to ZLGA. We belief they have all the equipment and machinery required to move the state forward in line with the vision of our envied governor and good people of our dear state. “At any point in time, ZLGA is always up to the task before it and the state government and people of the state thank them for bringing equipment to execute the project they were awarded especially this swamp scrawler that spent two weeks on the road from South-south to Kaduna”, he said. Earlier, the Managing Director of ZLGA, Abiola Bashorun said her company is evacuating all waste debris and reduce effect of waste on the water to curb diseases and floods caused by blocked water channels. 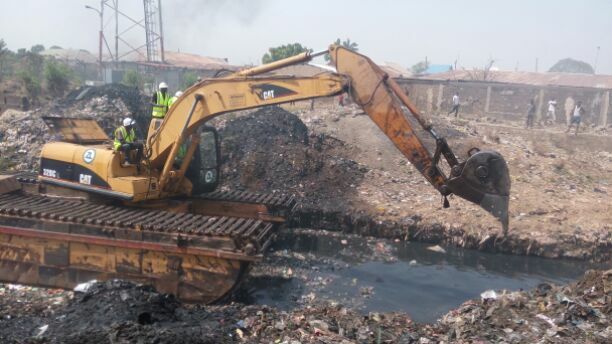 “As desilting is going on, we are cleaning gutters, drainages and canals simultaneously. To enhance the effect, we are also managing vegetation cover on roads by cutting grass under vegetation. We have done Kigo, Jos and constitution roads. We are on Ahmadu Bello way now and so on. “The governor has the love of his people at heart and that is why Kaduna is the first state in the Northern Nigeria to do what will touch lives of everyone residing in the state. “Our research showed that the river has not been cleared in the past ten years. The effect of this is that it will safe our people from health related challenges associated with stagnant water. We are getting ready for the next raining season. “This is staring from Kaduna State and we believe it will be envied by other states especially here in the North but we want to make Kaduna clean first”, added the MD.